The latest quarterly MoneyTree Report was just released, providing some insight into the state of medical device venture funding in the US. 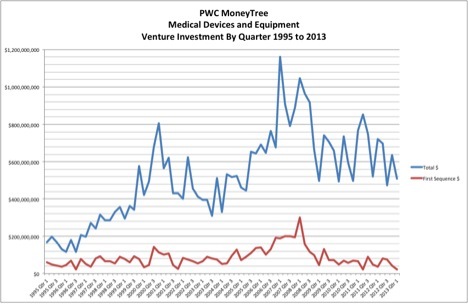 I downloaded and plotted the historical trend data for medical device VC investments in the U.S. from Q1 1995 to Q1 2013. Click on the thumbnails for larger images. First, while there was a downturn in the number of venture deals and dollars going into the medical device sector versus Q4 2012, it’s hard to tell if this is a real downturn, or we’re just seeing normal quarterly fluctuations. Second, overall venture investment dollars into the medical device industry have remained relatively steady over the last 3 years, and except for a burst of investment from 2006 to 2008, medical device venture dollars are above the historical rates for 1995 to 2006. 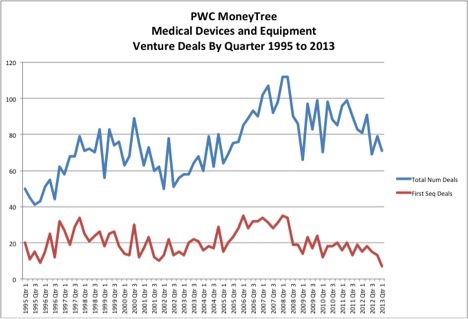 The same can be said for the number of medical device venture deals: relatively steady over the last three years, and above the historical rates from 1995 to 2006. Third, funding for new companies is definitely problematic. Dollars going into new companies are down to 1995-1996 levels and the number of new deals is at its lowest since the data collection began in 1995. Unsurprisingly, this implies that a greater percentage of dollars and deals are going to existing portfolio companies, reflecting a lengthened timeline to exit. Take a look at Fierce Medical Devices’ list of Q1’s top 10 medical device venture deals. From my read, five of the 10 are implants, and at least 7 will likely require FDA PMA approvals. Large clinical trials and prolonged regulatory reviews are still ahead. Clinical trials and PMA applications imply that significant ongoing investments will be needed. With total medical device venture dollars not likely to increase, new company funding will remain depressed for the foreseeable future. For entrepreneurs, this is not very good news. For committed early-stage investors, it’s a buyer’s market.